Teachers gathered ideas for the classroom by visiting businesses and organizations during GW’s Teachers in Industry Project. Teachers take pictures aboard the A380, the world's largest passenger airliner. An airport bustling with suitcase-toting travelers and thousands of badged employees may not seem like a traditional place to come up with lesson plans— but six teachers touring the halls of Dulles International Airport last week found inspiration in the building’s every nook and cranny. Maybe students could use geometric shapes to figure out how to contain airplane fuel, thought Laura Ratliff, a physics teacher from Heritage High School. Sam Oh, who teaches economics and social studies at Loudoun Valley High School, was interested in analyzing travel data to show his students the concepts of supply and demand. 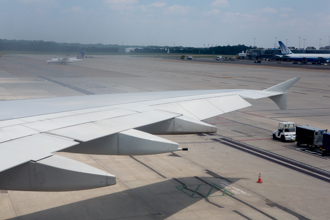 While standing on the runway watching planes rush by, Tuscarora High School math analysis teacher Kevin Malone contemplated the various angles and equations the scene could depict. 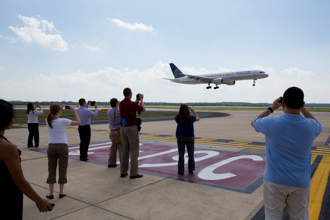 The visit to Dulles International Airport was part of the George Washington University’s three-week Teachers in Industry Project, which kicked off at GW’s Virginia Science and Technology Campus (VSTC) on July 8 and will run until July 26. High school and middle school teachers of core content areas were placed in externships with different businesses and organizations related to science, technology, mathematics and engineering. “We are trying to make teachers aware of the work environment that they’re preparing their students to enter and to help them see what they can incorporate into their classrooms,” said Janet Schiavone, a co-director of the program and an adjunct professor at the Graduate School of Education and Human Development. The program, now in its fifth year, drew a record number of 22 teachers from Loudoun and Prince William counties. This summer’s session also marked the largest number of industry partners, which included AOL, Dulles International Airport, Inova Loudoun Hospital, Lockheed Martin IS&GS Division, analytics company Neustar, REHAU Unlimited Polymer Solutions, three Loudoun County farms, Verizon Enterprise Solutions, and the cybersecurity management company Telos. Dr. Schiavone and Paula Harper, a co-director of the program, reviewed applications from teachers, keeping an eye out for applicants who expressed an interest in creative, out-of-the-box classroom methods and collaborative learning. The finalists were organized in small interdisciplinary teams and assigned four-day externships with two industry partners. The remaining time will be spent at VSTC, where the teachers will work on integrating their experiences into the classroom. Dennis Hazell, the associate executive staff coordinator at the Metropolitan Washington Airports Authority, was in charge of providing a backstage pass to Dulles International Airport’s operations. The airport has been participating in the program since it started, and Mr. Hazell has perfected the itinerary: It’s jam-packed with tours of the airport’s fuel farm; a trip aboard the A380, the world’s largest commercial flier fit for more than 500 passengers; and a walk onto the runway, where teachers listened to the powerful “swoosh!” of planes taking off just feet away. The teachers watched wide-eyed, asking enthusiastic questions and becoming students themselves. “There’s a whole chapter in one of our textbooks about airports and airport operations. I didn’t even necessarily comprehend what every single thing meant until the last few days. I get it way more than I did, and that alone will make me a better teacher,” said Erik Kittelson, an airplane aficionado and technology education teacher at Briar Woods High School. Mr. Hazell, who likens Dulles International Airport to a “small city,” said participating in the Teachers in Industry Project allows businesses to interact with their communities and foster closer ties with local schools. Different groups bonded with the agricultural world while visiting local farms Fabbioli Cellars, Endless Summer Harvest and Great Country Farms. Others connected with business heads at Verizon about global enterprise solutions and cybersecurity. The program also created a collaborative environment for the education professionals to share experiences and brainstorm lesson plans. After a session at the airport, the teachers huddled around a table, listing how they could apply what they’d seen to their curriculum. “It’s been so valuable to bounce ideas off each other,” Ms. Ratliff said. She also added that seeing the airport’s workforce opened her eyes to jobs and skills she could recommend to her students. The range of roles—from customer service to engineering—was a reminder of the interpersonal, communications and writing skills the teachers could incorporate into their lessons. While the takeaways were numerous, Mr. Malone explained he is most excited about all the authentic examples he can bring back to his classroom. Teachers sit in the first-class area of the A380. A shot of the A380. From left to right: Beth Levy, Erik Kittelston, Laura Ratliff, Dennis Hazell, Kevin Malone, Shannon Koval and Sam Oh. A visit to the airport runway to watch planes land. The teachers get a quick explanation of what happens on the runway.